Because freshwater covers such a small fraction of the Earth’s surface area, inland freshwater ecosystems (particularly lakes, rivers, and reservoirs) have rarely been considered as potentially important quantitative components of the carbon cycle at either global or regional scales. 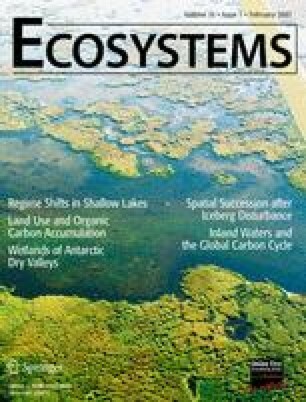 By taking published estimates of gas exchange, sediment accumulation, and carbon transport for a variety of aquatic systems, we have constructed a budget for the role of inland water ecosystems in the global carbon cycle. Our analysis conservatively estimates that inland waters annually receive, from a combination of background and anthropogenically altered sources, on the order of 1.9 Pg C y−1 from the terrestrial landscape, of which about 0.2 is buried in aquatic sediments, at least 0.8 (possibly much more) is returned to the atmosphere as gas exchange while the remaining 0.9 Pg y−1 is delivered to the oceans, roughly equally as inorganic and organic carbon. Thus, roughly twice as much C enters inland aquatic systems from land as is exported from land to the sea. Over prolonged time net carbon fluxes in aquatic systems tend to be greater per unit area than in much of the surrounding land. Although their area is small, these freshwater aquatic systems can affect regional C balances. Further, the inclusion of inland, freshwater ecosystems provides useful insight about the storage, oxidation and transport of terrestrial C, and may warrant a revision of how the modern net C sink on land is described. This work was conducted as part of the Integrating the aquatic with the terrestrial component of the global carbon budget Working Group supported by the National Center for Ecological Analysis and Synthesis, a Center supported by NSF (Grant #DEB-94-21535), the University of California and the A. W. Mellon Foundation at Santa Barbara, and the State of California. Comments from two anonymous reviewers along with those from E. Sundquist and R. Stallard (USGS) and B. Beisner and P. del Giorgio (UQAM) were instrumental in improving this manuscript.